May I please use this in a video? PLEASE? this is awesome! saw it someplace on the internet, had no idea you made it. Good job! Awesome ! Is this a custom made font or an existing one though ? nvm, hit the refresh button. i think the only problem with this is i wouldn't have known it said drum n bass if it wasnt for the dev title. Maybe its just my perception. Nice style But the s-charecters are ugly. 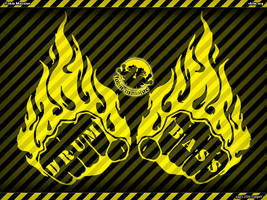 i love drum and base. dude i listen to old jungle as well, honestly I like pendulum better. just personal taste I guess. at least they have a flow, instead of just constant beats.